The land of Kerala which has given birth to innumerable far- sighted spiritual scholars and teachers, it is said, has gifted three Shankaras to the world. The first, of course is Adi Shankaracharya who enlightened the world with Advaitha and the second is Sree Narayana Guru who popularized this vedic theory. The third Shankara is none other than H.H Acharya Mahamandaleswar Kashikananda Giri Maharaj whose very purpose of birth seemed to be to establish and strengthen the indisputable nature of the Advaitha philosophy. 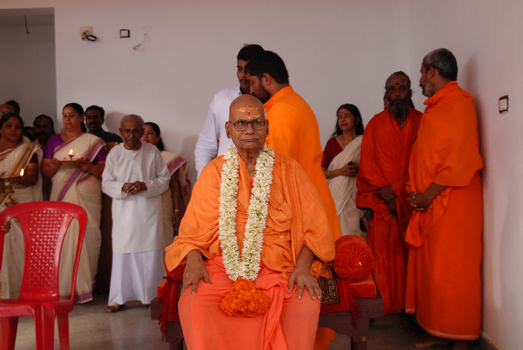 Born in 1924 in South Malabar, Kashikananda Giri Maharaj began his journey as a spiritual seeker at the age of 15. Barefooted and wearing nothing but a cloth around his waist, the young boy left the walls of his home and walked his way towards Varanasi. The journey thus begun, took him travelling by foot through rain and shine, across the length and breadth of India and the Himalayas which in those days was covered with thick jungle and teeming with wild animals. During the course of this time, Swamiji acquired a thorough knowledge of Sanskrit and several voluminous works in the language, as if specially blessed by Saraswathi Devi, the Goddess of Learning. One of his earliest works “Samanya Lakshanam” was prescribed as a text in the Varanasi Sanskrit University, the first Sanskrit university in India. It was here that Kashikananda Giri Maharaj joined for the Vedanta Acharya (M. A) course, passing out as the topper, to win the first of his 4 Gold medals, from the President of India. Interestingly, his answer paper that he wrote completely in verse, still hangs framed on the walls of the University as a masterpiece! Swami Kashikananda Giri Maharaj has gone on to author over 140 books with a total of 60,000 verses in them. It is no tall claim, to say that Swamiji could be the person to have composed the maximum number of slokas, next only to Veda Vyasa! With his authority over the scriptures and almost all Sanskrit texts, Swamiji can easily quench any doubts or challenges against the Truth of Advaitha or the meaning and scope of Sanyasam that may have arisen even from other scholars or saints. His answers to the challenges, given with the conviction of a Realised Soul, have been compiled in books such as “Advaitha Vijaya Vaijayanthi” and “Sanyasa Vidhi Vicharam” , in which he boldly asserts that Sanyasam is open to non- Brahmins and women as well. Swamiji’s title of Dwadashadarshaacharya Maha Mandaleswar denotes his supreme advisory position over the 12 systems or schools of philosophy and all the lineages of sanyasi parampara and the mutts (monasteries) under them. 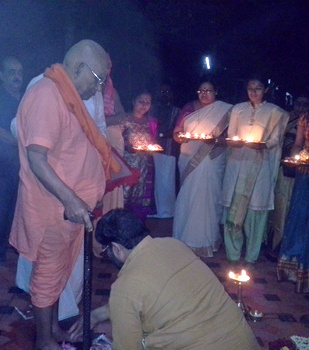 It is from this mahatma that our Swami Sandeepananda Giri was blessed to receive sanyasa deeksha. 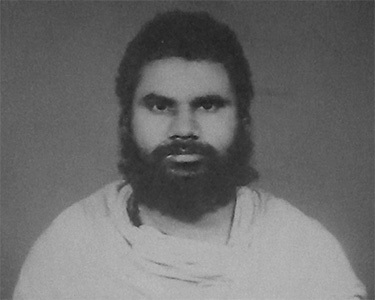 Swami Kashikananda Giri Maharaj’s title of Ananthasri Vibhushita indicates the limitless glory which adorns his name. With child-like simplicity and affection, and bearing the depth and greatness of the ocean, he lived like a true sanyasi in a simple ashram in Mumbai, aptly named “Anandavan”. This noble soul attained Maha Samaadhi in October 2014.